MANILA, Philippines - Team Bamboo's Sassa Dagdag wowed the crowd on her performances during the grand finals of 'The Voice Kids' Philippines Season 2 on Saturday, August 29, 2015 at the Newport Performing Arts, Theater, Resorts World Manila, Newport City in Pasay City. The 12-year old young artist from Angeles, Pampanga performed a duet song with the Megastar Sharon Cuneta. WATCH: Sassa sings Nicki Minaj's Starships on Upbeat Song round (video courtesy of ABS-CBN). Aside from Sassa, other artists rooting for the crown as the next grand winner are her teammate Elha Nympha and Team Lea's Reynan Dal-Anay and Esang de Torres. Text VOICE SASSA and send to 2366 for all mobile subscribers. 1 vote per artist per sim is allowed. Tariff is P0.50 per vote for Globe, TM, Smart, Talk 'N Text, ABS-CBN mobile subscribers and P1.0 for Globe postpaid subscribers. 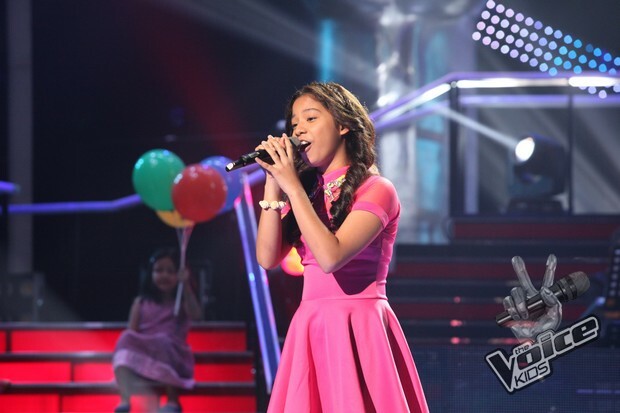 Is Sassa Dagdag your next “The Voice Kids” grand champion? The title holder will win a recording contract from MCA Music Inc., a music instrument package, a family utility vehicle, a house and lot worth P2 million, P1 million cash, and a P1 million trust fund.